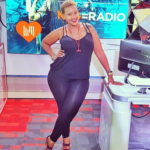 NRG Radio presenter Kamene Goro has revealed that she’s not interested in settling down anytime soon, or forever, since she has never been the same after her man dumped. The former TV host was dating a rich South African man who dumped her just hours to the wedding. He did it via WhatsApp a thing that left Goro’s heart shattered. Hurt Speaking to Betty on K24, the radio presenter confessed that since that day, she swore never to settle down and has never been interested in marriage. “You know the way you have your goals and KPIs (Key performance Indicators), marriage is not one of my KPIs and goals. If it happens great, although it’s not something I can say I am actively working towards” she told Betty Kyallo. Just Kamene, Kyalo was also dumped just a few months after her publicized wedding with Dennis Okari. Kyalo has also shared several times she’s not going to get married anytime soon. The post Kamene Goro tells Betty Kyalo she’ll never get married after South African man dumped her on wedding day via WhatsApp appeared first on Ghafla! Kenya.